Height: 1803 feet above sea level. Date climbed: First visit: 22nd August 2012 (walk 63). Second visit: 25th July 2017 (walk 131). 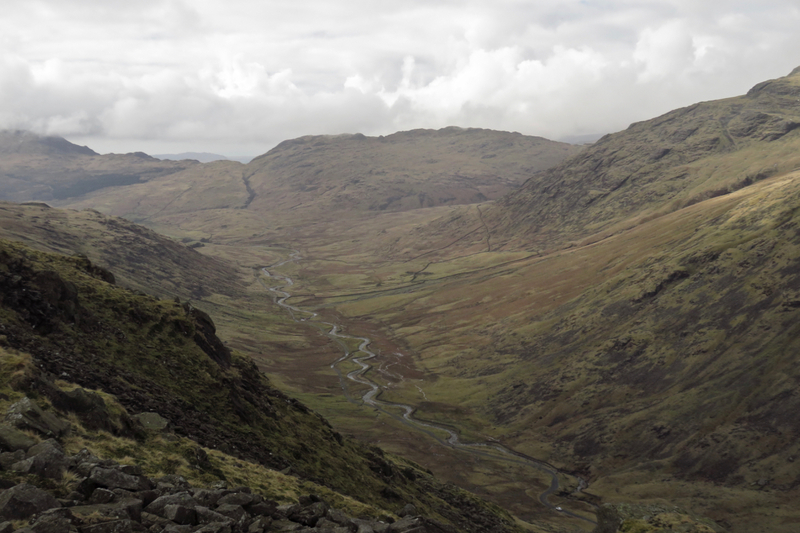 Route of ascent and descent: First visit: Ascended from Hardknott Pass, and then returned there, going on down to Eskdale via the Roman fort. Second visit: Ascended from the fort, via the top of Yew Crags, coming up to the summit near Eskdale Needle (see picture below). Descended to the pass. What Mr Wainwright says (from page 2 of his chapter): “On the south-western slope of Hard Knott the rocky cliffs of Border End fall steeply to an inclined grassy shelf, which extends for half a mile and then breaks abruptly in a line of crags overlooking the Esk. This shelf, a splendid place of vantage commanding a view of the valley from the hills down to the sea, was selected by the Romans towards the end of the first century AD as a site for the establishment of a garrison to reinforce their military occupation of the district…. 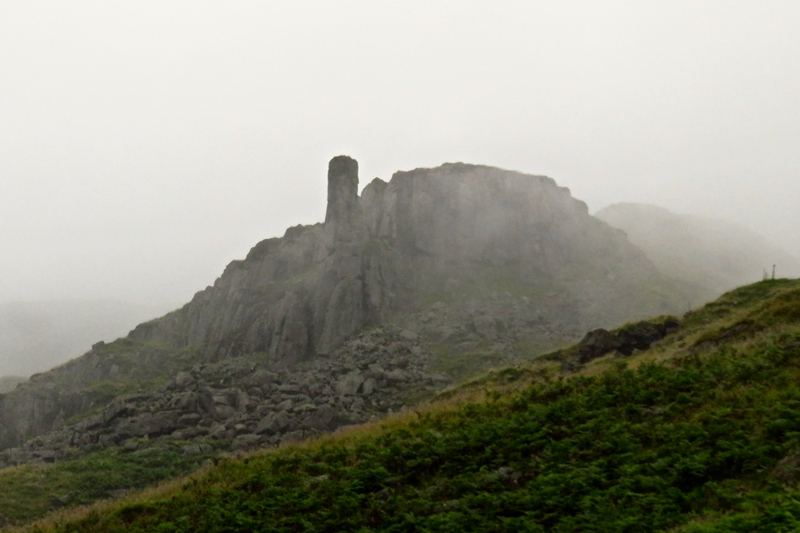 The ‘factory chimney’ of Eskdale Needle, on Hard Knott. 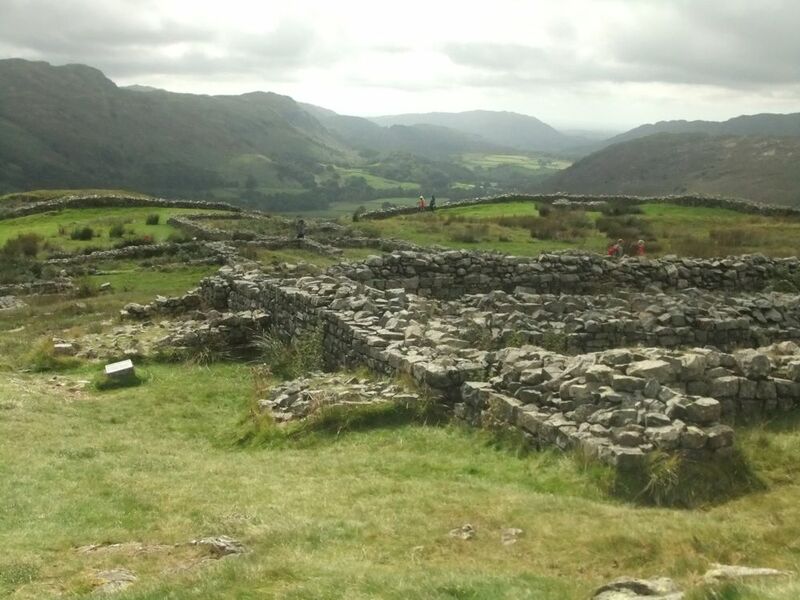 The Roman fort at Hardknott Pass – known as “Mediobogdum” – and the view down into Eskdale that explains why they built it there. 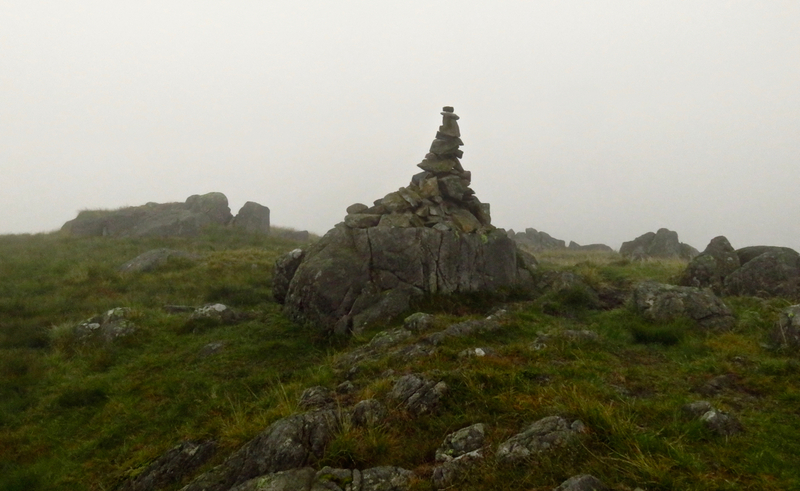 What I say: Hard Knott has various items of interest, but I have not seen them all. On both occasions I have climbed it in poor weather — note how it does not yet have a decent picture of itself on this page, and it has not yet managed to at least try to impress me with its view of the Scafell range. However, I did think the Roman fort was pretty cool – there aren’t any other fells in the Lakes (or in many other places) that can claim that as a distinction. Located, as said above, on a high shelf below the shapely peak pf Border End, it is a very atmospheric spot, and it is easy to fall into the same kind of reverie as Wainwright, wondering what it must have been like to have been stationed here. Worth a visit, and it gave the descent of Hard Knott an interest it simply could not have achieved through landscape alone. Eskdale Needle is also worth seeking out; an extraordinary obelisk, looking as much like a factory chimney stuck 1500′ up the side of a mountain as anything else.